The one thing that I love most about sewing is the immediate gratification. This was not the case with knitting for me...some of my dear friends can attest to that! After all of the fabric cutting, you can essentially have a finished product of use after just 30 minutes of work. It is for this exact reason that I enjoy making the Butrercup Bag over at MadebyRae's blog. The bag only includes seven or eight pieces of fabric and it is easy to modify. 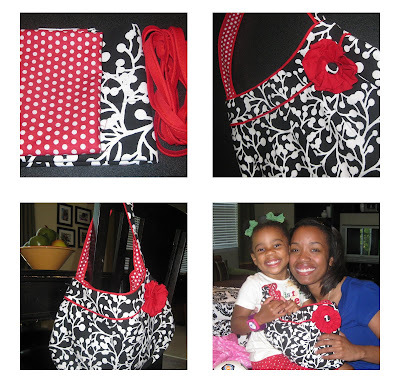 The pattern is free and for just $10, you can buy the license to make and sale the bag yourself. This is my fifth time making one of the bags, and my second time making one with a piped trim. One word is caution...the original pattern makes a small bag! For the one below, I enlarged the pattern by 30% onto 11x17 paper. This size is much more usable, IMO, by the average woman! I also added a simple fabric flower and completed it with a button that I covered using the main black/white fabric. I created this bag on Thursday night for our goddaughter, EEE, in honor of her 25th birthday. She planned a visit to be with her parents and would be visiting us as well. She loved the bag!!! It felt so good to be sewing again with all that I have had going in my life and this was the perfect project to jumpstart me back into action. I always enjoy seeing three pieces of fabric and some pre-made pipied trim turn into something wonderful. If you decide to make a bag, please share photos; I would love to see them! I love black and red together... what a great choice of fabrics! I love the fabric combination! It reminds me of damask, but not quite. It is really cute. I need to try this pattern this summer. You have inspired me to sew at some point this summer when I slow down. Great job! @ Mary...thank you woman! I really enjoyed making this bag and was SOO happy that our goddaughter loved the bag! @Kristy...girl, you are getting like me with the double posts ;). Thank you for the compliments on the bag. I fell in love with the fabric and was suprised when I found it at Hancock Fabrics. Like I said before, you need to try the pattern...it is super easy with some great instructions!